Published in 1923 and translated into more than twenty languages, this book is truly a timeless masterpiece and in my opinion should be the universal bible. A must read for all. Each sentence is undoubtedly magical in its words and massages your soul with satisfaction and yearn for more. It’s one of those books that flows so beautifully that it is hard to put down, yet each verse explodes with profound insight that you need to break and absorb the brilliance. 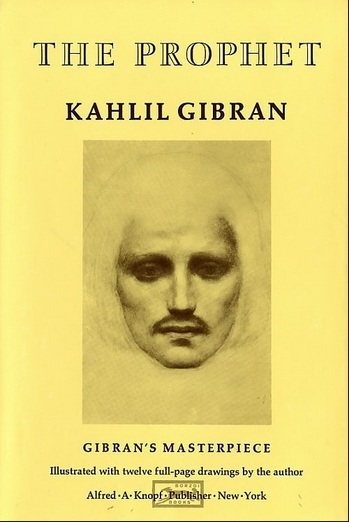 Gibran’s philosophy on life is poetic, lucid, and a classic for all to live by for all time. He gracefully touches on 26 of the most important aspects of life and his words are powerfully intense. Touching on love, giving, work, joy and sorrow, freedom, pain, friendship, time, and more, there is no point that’s overlooked. These 96 pages are an all-consuming read, filled with enlightenment and wonder. You will not be disappointed. The Prophet certainly tops my lists for a must read, must have, and a must live. Please treat yourself and get lost in the eloquent words of Mr. Kahil Gibran. Thank you for sharing such a great review! I’ve always wanted to check this one out, but for some reason never have. I’ll have to pick it up soon! Either way, if you’re ever interested in some other awesome book reviews and musings, be sure to follow! Thanks!